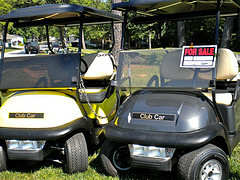 Consider a used Club Car golf cart if you are in the market for a used electric golf cart. I've been a Club Car owner for almost 20 years and while I've looked at other makes, like EZ Go and Yamaha when it has come time to upgrade, I always end up with another Club car - here's why. These golf carts are very reliable and are a good value for the money. When we first moved to our golf cart community, this was the golf cart make that we purchased - 14 years ago. Other than replacing batteries and a tire (and a smashed in headlight) it has caused me no problems. I had it painted several years ago, so it runs and looks like new. See for yourself - this is me in my 1987 used Club Car. What should I look for in a used electric golf cart? 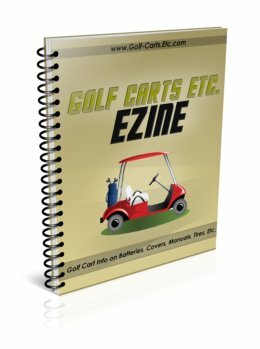 Consider buying from a dealer who has refurbished the cart. 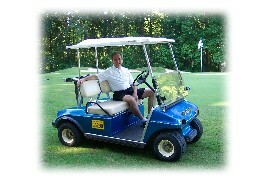 Golf cart dealers get their used carts from golf courses that have upgraded their carts. 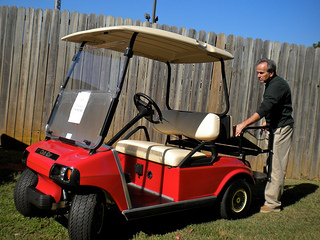 Dealers often sell refurbished golf carts with a warranty. Find out how long the warranty is good for and what it covers. Usually you can get a used Club Car cheaper buying from an individual. However, in this case, you are buying "as is." It becomes more important to perform a good inspection. What should you look for? If you cannot find a serial number plaque contact Club Car with the serial number from the transaxle, electric motor or gas engine. Utilizing that information we can assist you with identifying the serial number of your vehicle. 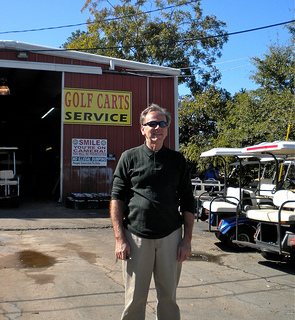 Around Peachtree City there are several golf cart dealers that sell new and used golf carts. Sometimes the used golf carts are from trade-ins. These carts are sold "as is." Other times the golf cart dealer has bought a fleet of "retired" golf carts from a golf course. Instead of selling them "as is", they actually refurbish them with new batteries, cables, tires and lights. Refurbished golf carts usually come with some kind of warranty. When shopping around for a used golf cart, it's a good idea to check out the refurbished golf carts. 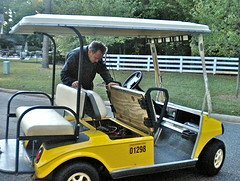 Unlike regular cars, there is no golf cart "blue book" AND unlike cars, the age of the golf cart is not as important as the condition of the cart. 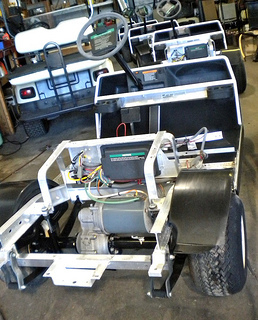 A refurbished 1987 Club golf cart with new batteries can sell for more than a 2000 Club golf cart with old batteries and in poor condition. 2. How well maintained was the cart. Check the water levels of the batteries. 7. The condition of the seats. Check for tears or stains. Look at several golf carts to get an idea of used golf cart values in your area. Be sure to test drive them. While driving pay attention to the power, speed, and brake conditions. I like to test drive the cart up hill to check out it's speed and power.